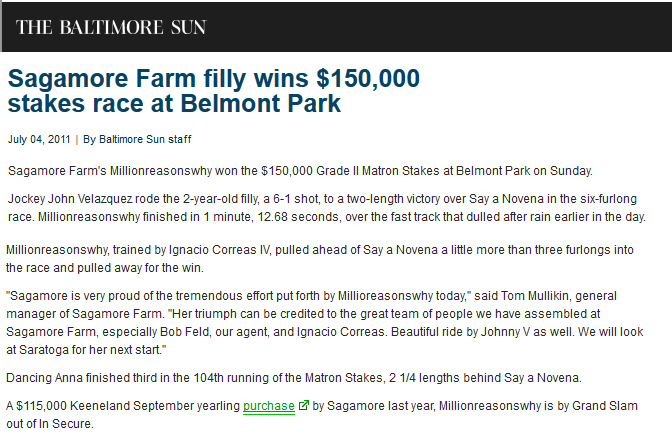 Sagamore Farm’s Millionreasonswhy won the $150,000 Grade II Matron Stakes at Belmont Park on Sunday. Jockey John Velazquez rode the 2-year-old filly, a 6-1 shot, to a two-length victory over Say a Novena in the six-furlong race. Millionreasonswhy finished in 1 minute, 12.68 seconds, over the fast track that dulled after rain earlier in the day. Millionreasonswhy, trained by Ignacio Correas IV, pulled ahead of Say a Novena a little more than three furlongs into the race and pulled away for the win. Dancing Anna finished third in the 104th running of the Matron Stakes, 2 1/4 lengths behind Say a Novena. A $115,000 Keeneland September yearling purchase by Sagamore last year, Millionreasonswhy is by Grand Slam out of In Secure.